You can’t go wrong with a Macallan. Or can you? As I were not longer sure I really wanted to give a try to the new range: The 1824 Collection, released a few months ago to replace their core range of bottles. So say goodbye to 10 years old, 12 years old, 15 years old Macallan ( stock while you can, you fools! ). So when Steve from The Whisky Wire proposed a tweet tasting about Macallan new whiskies I couldn’t but to apply. 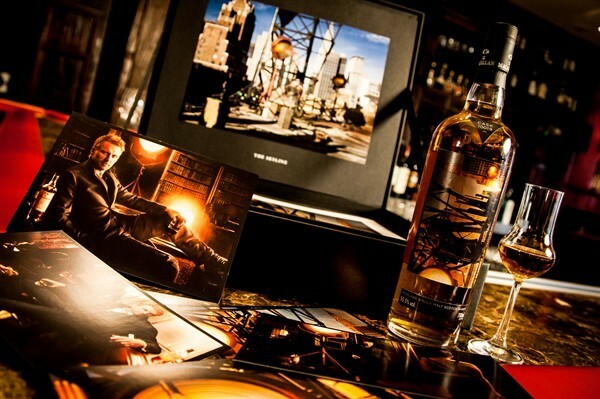 I have to say that, as everything Macallan related, this is one of the best, most precious presented samples set ever. In case you have been living under a rock in the last year, or just that you arrived here through Google looking for the Best Single Malt Whisky in the World, the Macallan has recently decided to replace their core range of bottles with a non age statement bottles. It is quite a bold movement. The Macallan Master Distiller Bob Dalgarno, explains that this move allow them to deliver simply the very best product without having the burden of age statements. Other persons said that this desperate movement by Macallan is just the direct result of having run-out of old stocked whiskies ( just go and try buying a Macallan 25 years old ). I have my mind clear and open, and really I don’t care about how old is the whisky but how good is it… BUT… recently we have lots of NAS whiskies scaling above £100 easily. That’s no way!. So I poured the samples and decided I could add a few more drams into the tasting: Macallan Elegancia 12 years old, and both Macallan 18 years old and Macallan 18 years old Fine Oak. Really pay attention to the natural color of each whisky. I have to recognized that they have placed lots of attention to this kind of details. Palate (89): smooth, powerful. honey, nuts, wood, vanilla, tobacco, spices. So based on other whiskies I have already tasted I rate this Macallan Gold with 90 points over 100. Nose (91): more than average. honey, wood, sultanas, vanilla, oranges, tobacco. Palate (91): powerful, oily. honey, nuts, wood, raisins, vanilla, tobacco, leather. Finish (91): longer than average. honey, leather, nuts. So based on other whiskies I have already tasted I rate this The Macallan Amber - 1824 Series with 91 points over 100. Nose (92): more than average. honey, figs, raisins, oranges, wood, spices. Palate (91): powerful, oily. honey, raisins, vanilla, citrus, nuts, spices, cinnamon, wood. Finish (91): longer than average. honey, leather, wood, almonds. So based on other whiskies I have already tasted I rate this The Macallan Sienna - 1824 Series with 91 points over 100. Palate (92): smooth, oily. honey, wood, citrus, mango, spices, cinnamon, chocolate, almonds, salt. So based on other whiskies I have already tasted I rate this The Macallan Ruby - 1824 Series with 92 points over 100. And finally a surprise!. I retaste Macallan Elegancia 12 years old. This was the first single malt I ever tasted and the one that turned me into whisky. I realized I had never wrote a proper tasting note of it… so risking the fact of it not living the expections I went and bought a new bottle. 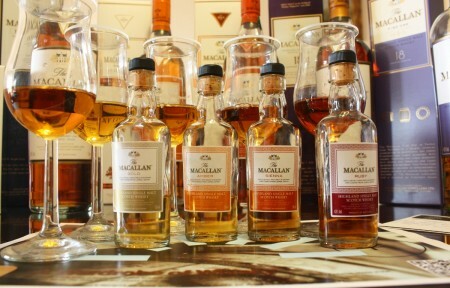 The Macallan Elegancia has been matured for a minimum of 12 years in a hand-selected and unique combination of sherry oak casks, which have previously held both Oloroso and Fino sherries. Distilled at this Speyside distillery, Macallan Elegancia is one of the best whiskies I have had and the the one that introduced my into the pleasures of single malt whiskies. Lots of sweet and nutty aromas on this one. Very recommended. If you like this style of whiskies you must try the epic and hard to find Macallan 10 years old Cask Strength. Nose (89): more than average. honey, oranges, vanilla, spices, nuts, wood. Palate (89): smooth, oily. honey, vanilla, wood, citrus, spices, cocoa, leather, almonds. Finish (90): longer than average. honey, wood, nuts. So based on other whiskies I have already tasted I rate this Macallan Elegancia 12 year with 89 points over 100. 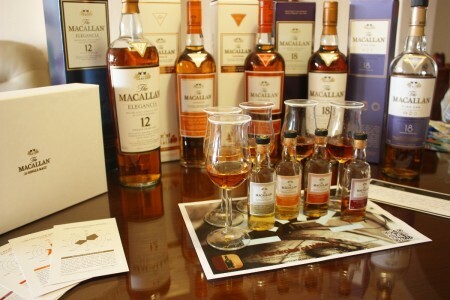 As with anything related with Macallan you know you are paying for a luxury item. The Macallan is not just a single malt, it is also an item of status, you drink Macallan and you belong to wealthy social class… and well… you all know you have to pay for that. 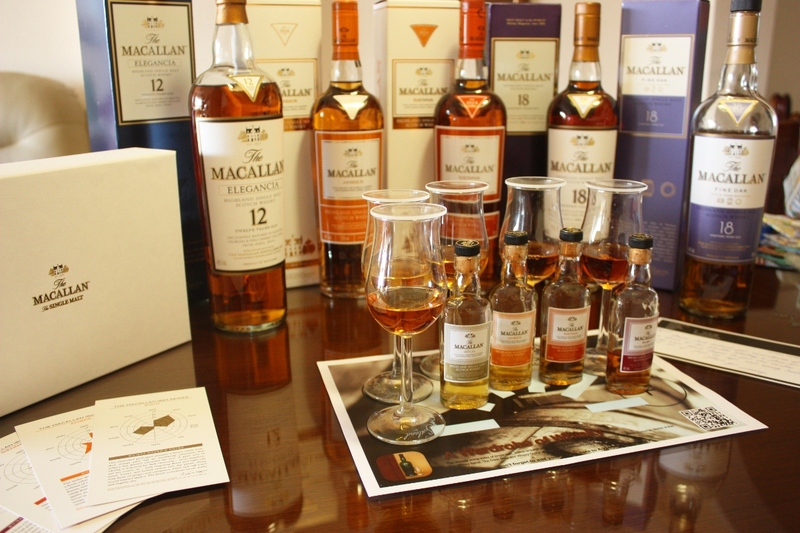 My personal preferences for #TheMacallan1824 tasting was Amber, Sienna, Ruby and Gold. All of them are so far excellent whiskies and this order takes into account that a bottle of Ruby is almost four times as expensive as a bottle of Amber.